Game 3 of the 2003 NBA Western Conference First Round. The top-seeded San Antonio Spurs were visiting the eight-seed Phoenix Suns. Powerhouse vs. Underdog. The Popcorn Game. If you were a Wake Forest basketball fan in the mid-90s, chances are you became a San Antonio Spurs fan in the late-90s. And for one reason only: Tim Duncan. The former swimmer from the Virgin Islands turned future-NBA Hall of Famer was the pride of Demon Deacon fans. As boring as The Big Fundamental’s game was, you wanted to watch him at every opportunity. It was my first NBA playoff game and I was going to watch my hero. Nothing was going to ruin this night for me, but that didn’t stop a couple of grown men from trying. At 10-years-old you don’t expect to be heckled at a sporting event. But wearing the black and silver “21” with the name “Duncan” stitched above it on my back may as well have been a bright red target. The guys sitting behind me started throwing popcorn in the first quarter and it was on and off for the entire game. One kernel would fly by my left ear while the next would hit the “C” on the back of my jersey. A few jabs were made when the popcorn cannon was being reloaded. I didn’t know what to do. I learned very quickly that wearing an opposing team uniform into enemy territory, especially during the playoffs, was an invitation to the home fans. Thankfully the Spurs beat the Suns that night and went on to win the series in six games. That, however, isn’t even the most memorable heckling job that I have experienced in what’s now called the Talking Stick Resort Arena (that’s a mouthful). 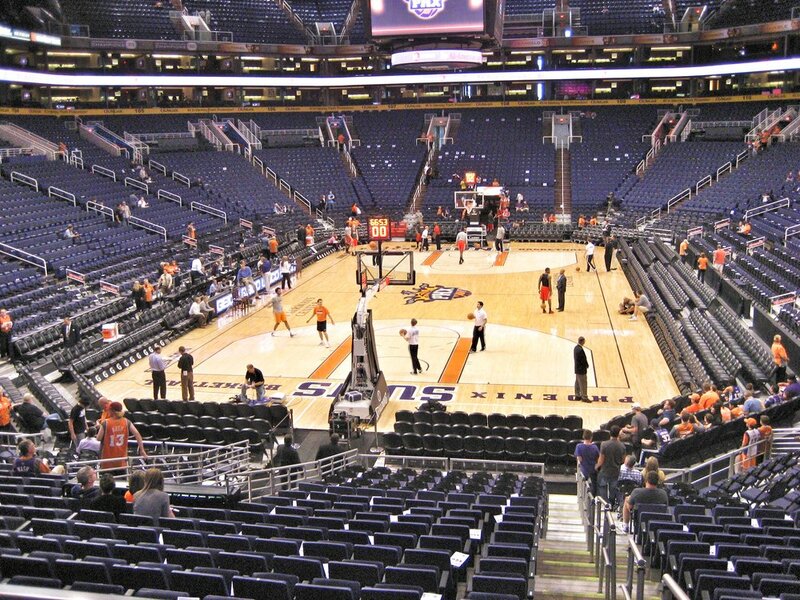 In 2014, I attended a Suns vs. Thunder game and had the privilege of sitting a few seats down from one of the craziest fans I’ve ever encountered. This OKC fan was looking for a fight. Maybe it was his 10th Bud Light, or possibly just the heat of the moment, but after three quarters of heckling nearby fans, he was ready to put his money where his mouth shouldn’t have been. I should have taken that bet. Heck, I’m not even a Suns fan, but that would have made my night. Not the money, but seeing my new friend from Oklahoma humbled a little bit. Oh well… even though he left with his cash, his team left with the L.
Talking Stick Resort Arena has left me with some good memories and helped me grow up a bit. However, nothing beats the moment that I shook hands with the late, great Craig Sager in 2010. I was on an arena tour before a game when I saw a familiar face waiting on Steve Nash outside of the interview room. I recognized him, but the name eluded me. Maybe it was because he was in what most consider “normal clothes” and not one of his signature suits. Realizing that I knew who he was, so he thought, Craig asked me if I wanted to take a picture with him. It didn’t mean much to me in that moment, but as I look back on the impact that Craig Sager had on the NBA, I am thankful that I met him. Not many people can rock a suit as bold as Craig Sager used to and get more than five words out of Gregg Popovich at the same time. Phoenix has been good to me over the years. I look forward to what it has to offer in years to come.